Dutch “eating designer” Marije Vogelzang curated an exquisite exhibition called "Food Culture: Eating by Design", now showing at Eindhoven's Designhuis until the 6th of January, 2013. Organized by Premsela, it showcases multisensory examples of how designers can help humanity to make changes to its food consumption patterns to ensure a more sustainable future. Click through the images to see some fascinating food-related furniture, information design -- like Honey & Bunny's "Food Design XL" colorful display seen above -- toys, futuristic aliments, aqua-phonic systems, homewares, workshops, films and much more! 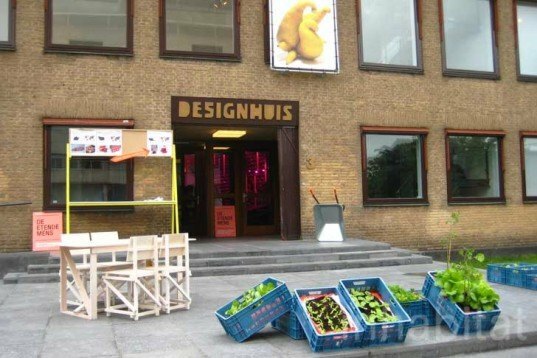 The first thing you see when entering Eindhoven’s Designhuis is Featuring’s grand cascade of real-life growing vegetables set in boxes. The beautiful display invited visitors to explore the exhibit’s 3-floors of multidisciplinary food-design projects. Dutch Mediamatic’s “Triple-decker Aquaponics Tower” is a sustainable ecosystem for food that combines growing plants with raising fish. Florence-based women’s collective Abeschi di Latte designed a pop-up workshop, “Pasta Herbarium”, where visitors can experience making pasta and sauces from scratch. 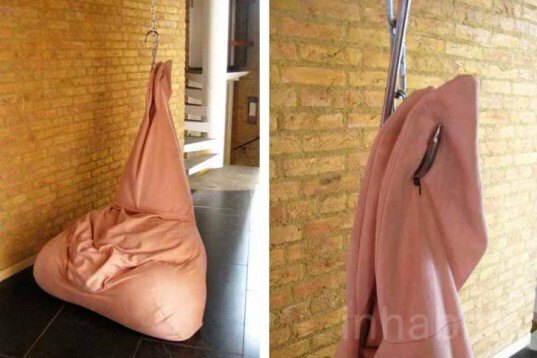 Yugoslavian designer Dejana Kabiljo created an kill-free, animal-free seat inspired by the sight of meat hanging in a butcher’s refrigerator. Dutch designer Tomm Velthuis‘ “Don’t Play With Your Food” is an ironic innocent-looking wooden set for kids meant to teach them about the heart-less food industry; including pig castration, the fattening of swine, greasy fast food and even deforestation. 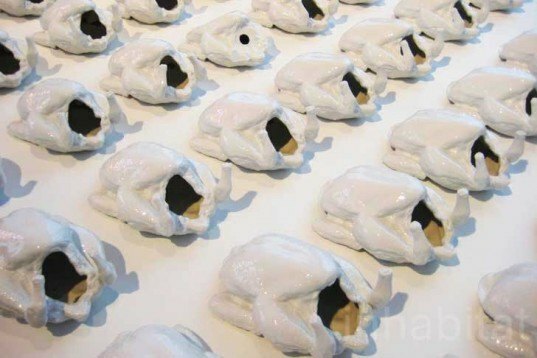 In order to reverse and poetically criticize low price of commercially-raised chickens, artist Artur Van Balen created the most expensive possible versions of these cheap chickens from porcelain. He calls them “Sainsbury Chickens”. Royal College of Art graduate Marre Moerel showed “Food on the Table”, a cruelty-free but visually stirring ceramic collection of tableware made from cast animal organs, such as cow hearts, pig intestines and sheep brains. 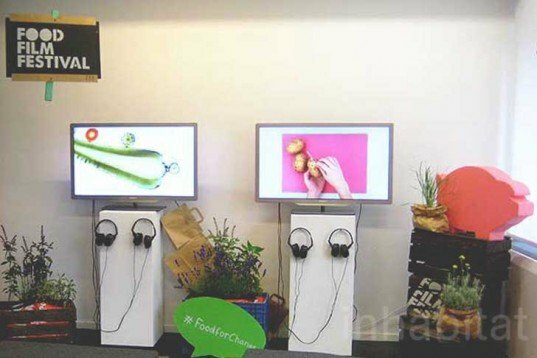 From the same creators of the lovely “Save Food From the Fridge”, their latest project is a mobile exhibition featuring local vegetables that have disappeared. It’s called “Save Food From the Supermarket”. British designer James King was inspired by science fiction and what the future of food could be. 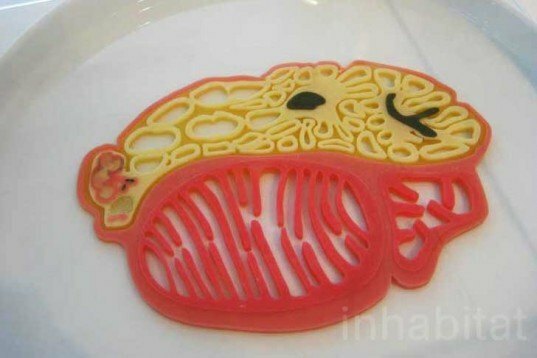 Here he developed food made from in vitro meat and other lab inventions. Insects are flying protein and many cultures around the world eat them; they are said to be tasty and more sustainable than farmed meat. In a book called “Het insectenkookboek” readers are taught all they need to know about cultivating and eating them. 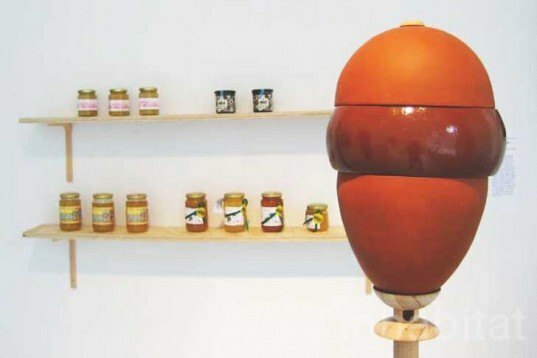 Local designer Coen de Koning created a beautiful, low-maintenance beehive made from terracotta and wood. The piece is designef for beekeeping in the city. 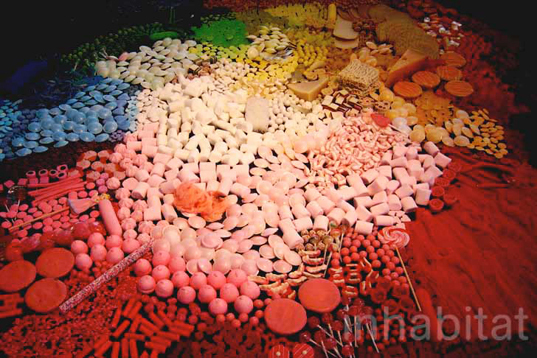 Emphasizing the social side of eating, British Simon Berry created an amazing project called “Aidpod”. 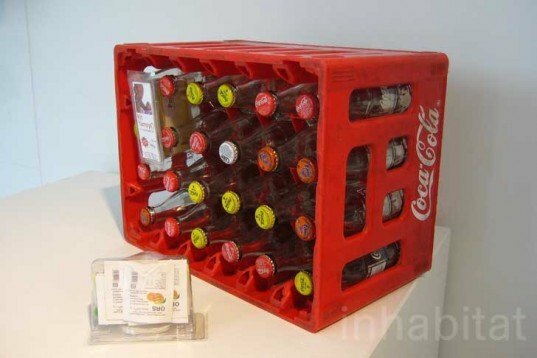 Here a case with medicine is fitted inside Coca-Cola’s crates. By cleverly using to soda-makers wide distribution network, medicine has the potential to reach even more people in need. German Uli Westphal created a graphic piece of nonstandard fruits, roots and vegetables called “Mutatoes”. The images are a critique to the over-designed, unnatural and monotonous food we eat. Design Academy of Eindhoven‘s graduate Marti Guixé baked “AutoBahn” cookies for eating while driving, and “I-Cakes”, a pie graph indicating the cake’s ingredients in percentages. The design turns treats into useful information. 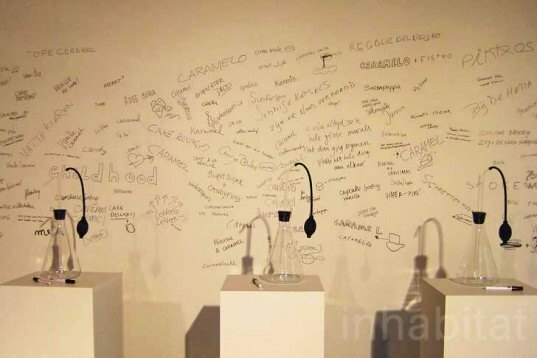 Vogelzang commissioned Flavors & Fragrances Inc. to design an olfactory display were visitors could recognize and associate scents with food written on the walls. The Food Film Festival was also present at the Designhuis screening a variety of food films and documentaries together with discussions, music and art. Focusing on the global issue of sustainable food, this beautiful, brutal and sweet exhibition shows visitors that food is not only for pleasure and folly, but we really can’t live without it. 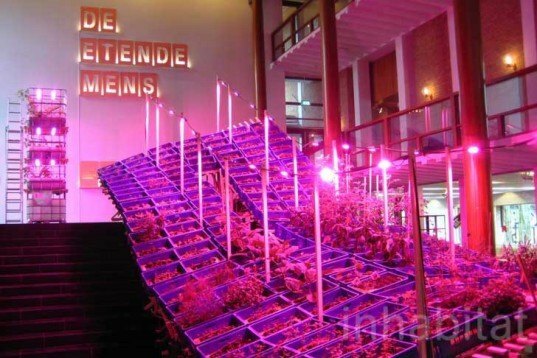 The first thing you see when entering Eindhoven's Designhuis is Featuring's grand cascade of real-life growing vegetables set in boxes. The beautiful display invited visitors to explore the exhibit's 3-floors of multidisciplinary food-design projects. 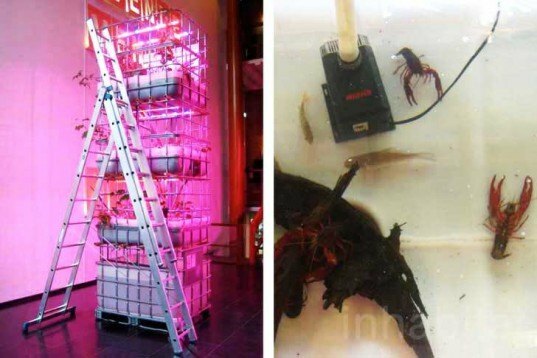 Dutch Mediamatic's "Triple-decker Aquaponics Tower" is a sustainable ecosystem for food that combines growing plants with raising fish. 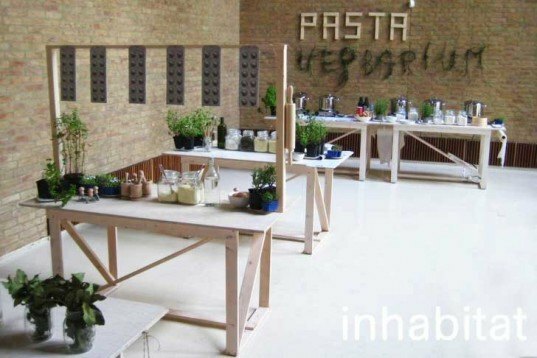 Florence-based women’s collective Abeschi di Latte designed a pop-up workshop, "Pasta Herbarium", where visitors can experience making pasta and sauces from scratch. Yugoslavian designer Dejana Kabiljo created an kill-free, animal-free seat inspired by the sight of meat hanging in a butcher's refrigerator. 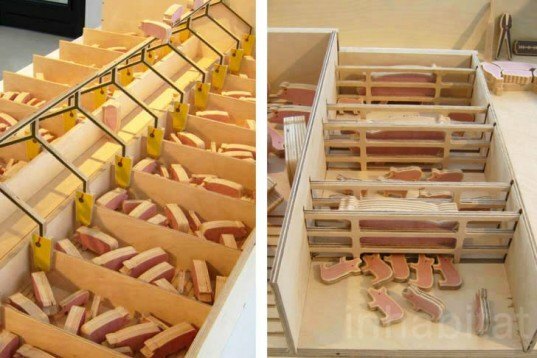 Dutch designer Tomm Velthuis' "Don't Play With Your Food" is an ironic innocent-looking wooden set for kids meant to teach them about the heart-less food industry; including pig castration, the fattening of swine, greasy fast food and even deforestation. In order to reverse and poetically criticize low price of commercially-raised chickens, artist Artur Van Balen created the most expensive possible versions of these cheap chickens from porcelain. He calls them "Sainsbury Chickens". 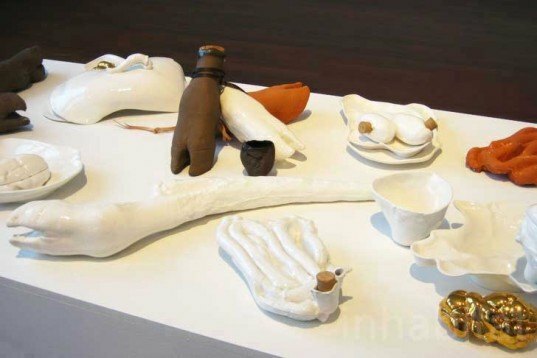 Royal College of Art graduate Marre Moerel showed "Food on the Table", a cruelty-free but visually stirring ceramic collection of tableware made from cast animal organs, such as cow hearts, pig intestines and sheep brains. 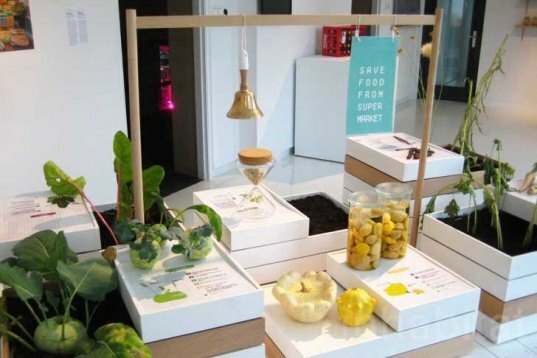 From the same creators of the lovely "Save Food From the Fridge", their latest project is a mobile exhibition featuring local vegetables that have disappeared. It's called "Save Food From the Supermarket". 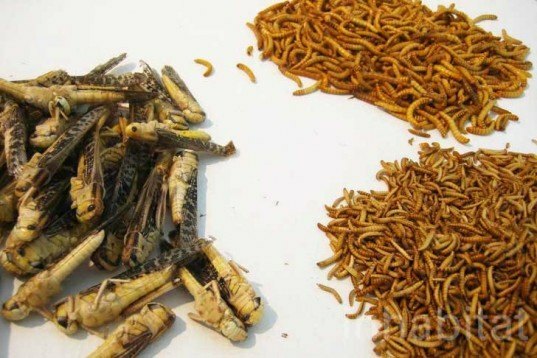 Insects are flying protein and many cultures around the world eat them; they are said to be tasty and more sustainable than farmed meat. In a book called "Het insectenkookboek" readers are taught all they need to know about cultivating and eating them. Emphasizing the social side of eating, British Simon Berry created an amazing project called "Aidpod". Here a case with medicine is fitted inside Coca-Cola's crates. By cleverly using to soda-makers wide distribution network, medicine has the potential to reach even more people in need. German Uli Westphal created a graphic piece of nonstandard fruits, roots and vegetables called "Mutatoes". 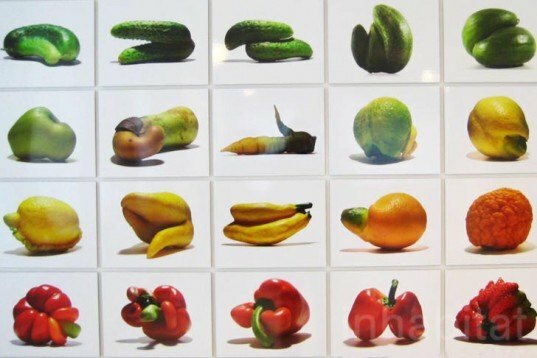 The images are a critique to the over-designed, unnatural and monotonous food we eat. 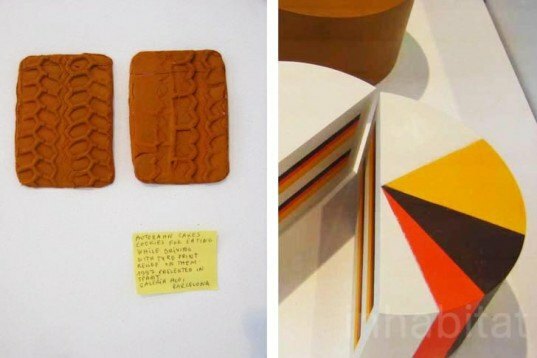 Design Academy of Eindhoven's graduate Marti Guixé baked "AutoBahn" cookies for eating while driving, and "I-Cakes", a pie graph indicating the cake's ingredients in percentages. The design turns treats into useful information. Focusing on the global issue of sustainable food, this beautiful, brutal and sweet exhibition shows visitors that food is not only for pleasure and folly, but we really can't live without it.